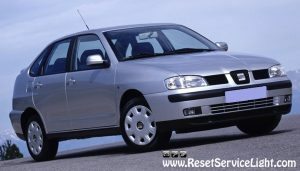 DIY, replace the glass of the left side mirror on your Seat Cordoba manufactured in the years 1999, 2000, 2001 and 2002. You can do the repair with your bare hands or you can use a flat blade screwdriver. Servicing the glass of the mirror is a simple task and will not require more than 10 minutes. At the beginning, pry out the old glass using your fingers or a flat blade screwdriver. If the glass is broken, you should use gloves to avoid hurting your hands. If the glass is still intact and you wish/need to take it out that way, you should pry it out slowly and carefully. Be careful, applying too much force will damage or break the glass easily. 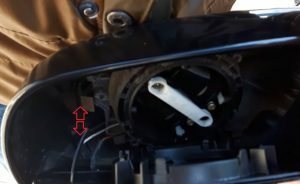 You should be able to detach it as soon as you disconnect the two wires used for heating, as shown in the image below. Now you can focus your attention on installing the replacement. First of all, make sure you reconnect properly the two electrical wires. The glass has a plastic bracket that has to fit into its place on the mirror. Put the glass on the alignment as in the picture below then push on it until it is fixed and you are done. 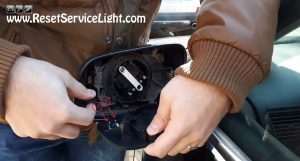 These are the steps you have to follow if you wish to replace the glass of the left side mirror on seat Cordoba 1999-2002. You can watch the next tutorial for a detailed presentation about the repair.